Hello there, glad you stopped in. Do you sometimes catch a glimpse of a color scheme or pattern and have to run home and try something similar for a card? That happened to me Sunday when a woman walked by with a beautiful knit sweater. It was layers of pastel colors with a white knit pattern. That day I went to the stamp room and layered distress inks on a glossy sheet of paper. Then I embossed with a white background stamp that as far as I know was NBUS (never been used stuff). I think I bought it at a stamp show years ago from Stamp Camp. The cupcake is a Martha Stewart punch, also NBUS. I scored the colored paper after it was punched. Then used the same punch on a strip of white sparkle paper to make the icing. All the confetti was punched from left over snippets. The saying that I used just came in the mail and was laying on the table. It was a free gift that came with a Purple Onion order. 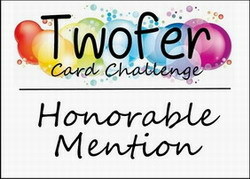 This card is going over to the As You See It Challenge where they are celebrating their 100th challenge. The theme of course is CELEBRATE. The challenge ends tomorrow so be quick to check them out. 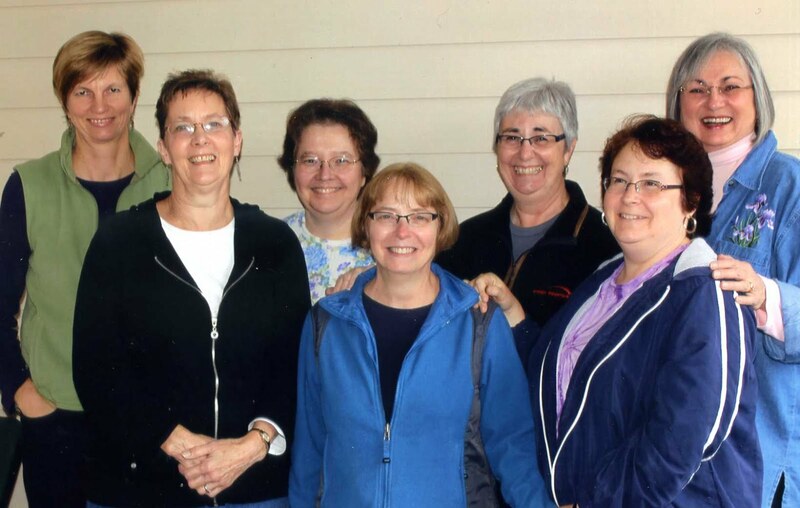 Tomorrow night the Cardologists will be celebrating with Mrs. B (you know who you are)! Cake, stamping and laughter. 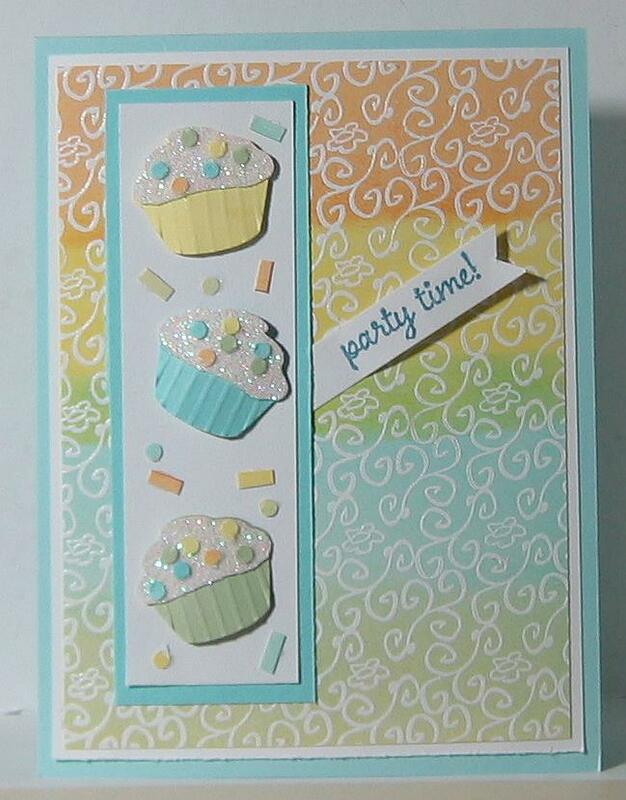 Great colours and I love the sponging and those cute cupcakes! Thanks for helping us celebrate 100 Challenges at As You See It Challenges this week! Yes, I have totally had that happen before. Love your colours and such cute cupcakes - perfect for a celebration. Thanks for playing along with our 100th challenge at AYSI! What a cute card! I love how you scored the cupcake liners! It makes them look so real! :) Thanks for playing along with the 100th Challenge over at the As You See It Challenge! I love the background, the cupcakes look so real...yummy. I'm wish I could have been there to celebrate, I can just hear all the laughter & fun. Glad everyone shared my piece & had a little extra slice. Happy birthday Melba. Miss everyone. This is so gorgeous, Dora! Susanne told me to come over and, boy, am I glad she did! Now, if you could just knit me this as a remake of the sweater you saw ...! Okay, okay, you can send me cupcakes in the mail instead!! I'm sure Mrs. Melba B. had a blast at her party and will treasure all her stunning cards forever! You Cardiologists know how to have a great time!! 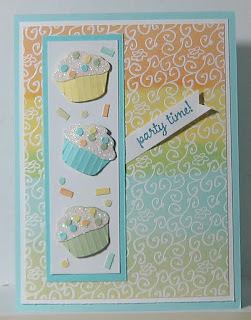 Such a sweet card, those cupcakes look good enough to eat, I love the way the icing sparkles (actually they look too good to eat lol)!